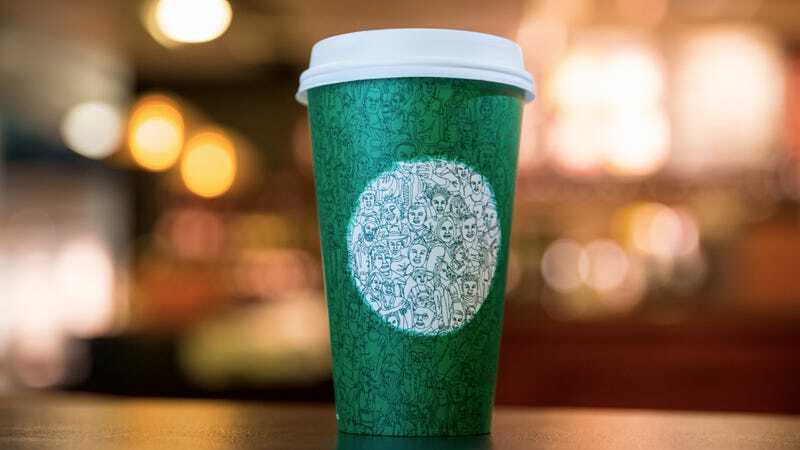 In this time of national strife, Starbucks would like to channel the anodyne vibes of the mid 1960s Youngbloods anthem, “Get Together,” with a limited-edition green cup meant to remind us we’re all connected and encourage unity. That should patch things right up! These cups have already been rolled out at the Starbucks nearest to Jezebel’s office, along with a door decal urging us to treat each other well or something. I have also, personally, begun being targeted by this promoted tweet. Think of how perfectly that’ll nestle between Donald Trump tweets! This time last year, Starbucks proudly unveiled its annual holiday cups, a minimalist two-tone red—which promptly inspired a War on Christmas freakout. But lest the Christmas warriors totally flip their lids, know that there are probably some more “traditionally” festive cups coming soon. Eater also reported that somebody on Reddit had shared a picture of what looked to be the usual red cups, but with three different designs, the one showing sort of a seasonal berry-branch-and-bird theme that would blend perfectly well with any store’s selection of Christmas wrapping papers. “In the Bleak Midwinter” vibes would feel very appropriate this year, that’s for sure. Everything’s going great here in America! Shining city on a hill of coffee beans! Can everybody please just shut up and put a smile on their face and drink their damn peppermint mocha already?